Before last year, I never wore a watch. I honestly did not think I would like wearing one, but then I got a wooden watch and I realized that I was wrong: I do in fact like wearing watches. It is so convenient to have the time on your wrist instead of having to juggle all of the stuff in your hands to find your phone just to figure out what time it is. Every since I got my first watch from JORD, Ian has been SO beyond jealous and whenever I wear it, he always mentions how he wants a wooden watch for himself. So, this year, I decided to surprise him with the Dover series watch in Zebrawood & Dark Sandalwood from JORD. This watch is so beautiful! It is made with 100% natural, hand-finished woods that are treated to be splash-proof. It has an aperture face, sapphire crystal glass, and genuine Swarovski crystal markers. Talk about gorgeous! To me, Christmas is a chance to take a break from real life and connect with close friends and family. Nobody is focused on work for once. Instead, we focus on each other and make memories that will last forever. I know most people love receiving gifts, but I love giving a lot more than receiving. This year, since Ian loved his watch so much, I am considering to give some of my other friends and/or family members wood watches. According to their website, JORD values sustainability, efficiency, and experiential living, which is also very important to me. 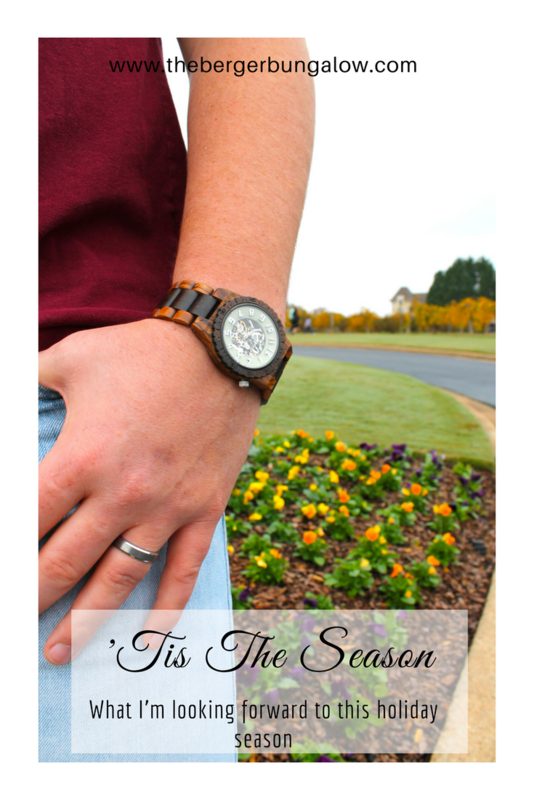 On their website, you can find both unique men’s watches, and women’s watches, as well. So excited about gifting these to some of the people that I love! If you want to gift a JORD watch to some of your family, I urge you to take advantage of this offer: all you have to do is fill out this form and you will be emailed a 25% coupon code – it’s great savings! This year, Ian and I are keeping old traditions that we have always had and we are also creating new traditions while we are at it! Our ‘old’ traditions are ones that mean so much to me, even if they seem like little things to others. For starters, we always have a Christmas Eve celebration with our whole family. This has changed over the years and has become smaller, but it is still so special! Another tradition that we are keeping is prime rib dinners on Christmas Day! My dad (and Ian as of last year) cook prime rib and everyone is invited! I love, love, love this tradition and it just doesn’t feel like Christmas to me without it. I’m not exactly sure what our new traditions are going to be yet, but I want to base it on what is important to all of us. I cannot wait to have a slow Christmas morning by the warm fire as we sip coffee and wait to open presents! I had to put this one on here just because I LOVE Christmas music. It seriously makes me so beyond happy and I’m very excited for it! Let me know what you are looking forward to during this holiday season in the comments below! Don’t forget to check out the JORD website to sign up here in order to get your 25% off coupon code.